Payeezy is a business platform oriented towards helping merchants establish or grow their eCommerce business. All of the elements necessary to help the merchant succeed in this domain are represented in the Payeezy solution ... from webstore capabilities (ours or through many partners) to payments from security & fraud prevention to reporting; from processing across borders to currency conversion. In many cases, small and medium sized business need some technical assistance with these solutions. We developed Payeezy.com to provide a simple, powerful ecommerce payment option for developers that delivers easy, scalable and secure online and mobile payments. Essentially, we are providing access to our unparalleled ecommerce product offerings by helping you integrate your solutions through the site’s open API environment. Code once, and you’re set to go. Our goal is to expose the depth and breadth of our assets, services, and processes to unlock additional business value to new and existing channels. Payeezy is an eCommerce business platform, so any merchant wanting to establish or grow their eCommerce business can leverage its capabilities. Whether looking for a more PCI compliant solution or wanting to seamlessly integrate payment processing to your website, the Payeezy solution makes it easy to accept a wide range of payments anytime, anywhere. A highly intuitive web-based interface and simple APIs allow you to remove the complexity of accepting card-not-present payments quickly and easily, keeping your focus on operating and growing your business. *Availability of certain Payeezy capabilities depend on the merchant’s domicile. Click here for details. What kind of things will I have access to? Explore our site anonymously if you like; you’ll even be able to test the code samples we provide on the API Docs & Sandbox tab. Once you create an account with us, you’ll be able generate a unique APIKey that will allow you to generate transactions against a test account that you can find in your My Merchants tab. Fully register and certify your solution, and you’ll be able to bring merchants on board. What's more, become a payeezy partner and generate money whenever a merchant referred by you processes a transaction. Explore our Payeezy site anonymously and play with our APIs in the sandbox. Create an account with your email address to get access to our sandbox environment. It should take just 20 seconds. Begin the integration process. Use your API key and API secret. Add merchants to obtain the merchant token. Are there situations where alternative solutions should be used instead of Payeezy? While Payeezy is an ideal solution for enabling small and medium sized businesses (SMBs) to accept payments either online or via a mobile device, there are scenarios where it doesn't apply. The solutions vary based on the merchant's country of domicile. Please contact us to find the best solution for your type of business. Now that I have integrated and can begin processing payments, can I help businesses get their merchant account? Absolutely! Once you have fully registered and certified your solution, you will be able to Add Merchants^. Simply click on the My Merchants tab and enter the necessary merchant information, and we'll do the rest. You'll be notified once they've been approved, and better yet they will appear in your merchant listing! ^ Merchant self-boarding is currently only available to our partners in the US. More regions will soon be supported. In addition to the REST APIs and corresponding SDKs/Libraries found on our developer portal, the Payeezy eCommerce Solution provides additional options to better assist you in delivering easy, scalable and secure online and mobile payments! Why do I need a demo gateway account? How do I request one? Simply stated, the APIs represent a simple way to send transactions to a gateway account from a website/mobile app. While you are integrating to our APIs, it would be useful for you to see how your transactions flow through to the gateway account. For this purpose, we allow you to route transactions from your API integration to a demo gateway account. Also, a demo gateway account allows you to explore all the features of the gateway such as virtual point of sale, advanced fraud filters, etc. For a non-US merchant integration, you can request a demo gateway account by contacting your merchant acquirer. My sandbox integration is complete, how do I go Live? Once your developer account is certified, you can proceed to add live merchant accounts. Navigate to the Merchants page, click on "Live" and then click on "Add a merchant". If you are adding a merchant who already has a merchant account with First Data, select "Add your existing merchant account" and follow the instructions on the screen. In order for this to work, the First Data merchant account must be enabled for Payeezy API. If you are not sure what this is, check with the merchant service provider. If the merchant does not have a First Data merchant account and needs to apply for one, select "Sign up for a merchant account" and follow the instructions. If for any reason, you are unable to add your merchant account, email payeezyboarding@firstdata.com with the Merchant ID (or storeID), DBA name and developer account email address. We will add the merchant account to your developer account manually within 2 business days and send you a notification. As a current First Data merchant, I want to transact through Payeezy APIs/Mobile payments. What is the process? As a first step, sign up at developer.payeezy.com and get certified. Once your certification is complete, developer portal will automatically redirect to “Add Merchant” page. Click on "Live" and then click on "Add a merchant". If you are adding a merchant who already has a merchant account with First Data, select "Add your existing merchant account" and follow the instructions on the screen. In order for this to work, the First Data merchant account must be enabled for Payeezy API. If you are not sure what this is, check with your merchant service provider. My code works in sandbox but I receive a 403 error in production. Why? This is a common issue when developers use the API key and API secret that are published in our Docs and Sandbox pages. This is because the HMAC validation is turned off for that specific combination of API key and API secret. Therefore, the error never surfaces in the sandbox environment and only surfaces when you hit production with your own API key and API secret. To prevent this issue, always use the API key and API secret from your account to build or test your integration. What payment methods and integration options are available in my region? What programming languages, platforms, etc. do you support? OUr APIs are language agnostic, so choose any language you please (CURL, Java, Node, Python, Ruby, iOS, Android, etc) that lets you make a RESTful call. And we are always interested in hearing your thoughts on where else we could be focusing! Comment in our Forum to see what others are thinking. What are the steps required to integrate with Payeezy from start to finish? Using below listed steps, you can easily integrate your mobile/web payment application with Payeezy APIs And go LIVE! Sign up for a free developer account with LITE Registration. All you need is your First name, Last name and a valid email address. Navigate to developer portal https://developer.payeezy.com/ from your browser and click on CREATE ACCOUNT. c Note: Portal registration requires a valid e-mail address. Once registered, your email address cannot be changed in future. All e-mails from the system will be sent to this registered email address. The e-mail address will not be made public and will only be used if you wish to receive notifications by e-mail. After you provide registration information an email is sent to you with further instructions to activate your account. Think of this as a unique app name that is used to identify your application. This is unrelated to the name you would use on Apple’s App Store (if you are integrating with apple pay/iOS) but it can be the same. Login to your Payeezy developer account and navigate to the "APIs" page. Click the “+ ADD A NEW API” button. On the next screen you name your application. If the API is only for testing, choose "Sandbox". If you plan to use the API in the production environment, choose "Live" as well. Click on the API you just created. You will see your API key and API secret. These are header parameter values that uniquely identify your transactions associated with all API calls. The Merchant token and JS_Security_key are available from the "Merchants" page in your developer account. These values are unique for each merchant. For testing, we have made available a First Data owned demo US gateway account called "Acme Sock". You may choose to use this or connect to your own US demo account or non-US demo account by clicking on the "Add a demo account" button. Follow the instructions on how to add your demo account or how to sign up for a demo account. Once you add your demo account, you should see it listed in the Merchants list under "Sandbox" and you should also see the merchant token and js_security_key pertaining to that account. The TA_TOKEN is "NOIW" for the sandbox merchant. For live processing, the TA_TOKEN will be available from Payeezy Gateway terminal. The API key and API secret are created by you and are available in the "APIs" page. The CSR or public key are created by you and are available in the "CERTS" page. To test and integrate your payment application with Payeezy CERT environment use following URL: https://api-cert.payeezy.com/v1/. In order to add Merchants and Go-Live with Payeezy, you need to get certified as a Payeezy Certified Developer. Certification involves: 1. Completing a full registration 2. Submitting a sample payload as a valid JSON Purchase transaction in SANDBOX region. JSON request will be tested against Payeezy Cert/Sandbox environment. After you click on the certify button, JSON response and response message will be provided below certify button. You will be certified after submitting the CERTIFICATION form. Once your certification is complete, developer portal will automatically redirect to “Add Merchant” page. Click on "Live" and then click on "Add a merchant". Replace Sandbox merchant token with live merchant token. Replace Sandbox JS_Security_key with live JS_Security_key. Ensure that API key and API secret are enabled for live processing. Use live certificates for mobile wallet integrations. What are the different bank response codes? Why was my transaction successful even though an incorrect card type was provided in the API request? When you process any transaction using the original credit card number, the Payeezy system is able to determine the card type programmatically, based on the length of the number and the first digit and override the provided card type, if necessary. However, when you use a token number instead of a card number, the first digit of a token number is random and so the system has no way to programmatically determine the card type, so the card type you provide is trusted. In this case, if an incorrect card type is provided, then the transaction gets declined. What are the differences in integration for a US merchant account vs non-US merchant account? One of the biggest benefits of using our APIs is that once an integration is built, both US merchants and non-US merchants can use it. There are, however, 2 important differences to note when developing for US merchants vs Non-US merchants. 1. When using the GET Token API (/securitytokens), US merchants will need to send the TA_TOKEN parameter while non-US merchants will need to send the "Currency" parameter. 2. For a non-US merchant, the parameter “merchant_ref” should be unique for each transaction. It is not required for US merchants but is definitely recommended for ease of reconciliation. 3. In token based transactions, for non-US merchants, CVV is required. It is not required for US merchants. Once the above caveats are handled in your integration, it should be usable by US merchants as well as Non-US merchants. What are the advantages of using Payeezy.JS integration method over Payeezy Direct API method ? When you interface with the Payeezy.JS integration method, you never touch or save consumer’s credit card details. This diminishes the PCI burden on your end reducing your infrastructure costs, audit risks and many undesirable things while giving you complete control of check out process. The process involves your web infrastructure serving up payment pages that fully control the checkout process. Once the consumer is ready to check out, has entered and confirmed their credit card information, and has hit the “pay” button, a Payeezy.js <script> tag included on the page intercepts the form and asynchronously posts the credit card details to our servers. This call uses JSONP over https passing in a unique API key and identifier. Upon either authorization approval or a straight GetToken method, we will return a token and Payeezy.js will save the token information (instead of CC details) in a hidden form field on the checkout page and submit it your server. Your server will then submit the token to Payeezy to complete the transaction using the appropriate server side library via an API call using HMAC authentication over HTTPS. Bottom line? This is the simplest, most secure and most flexible way to integrate your checkout pages with our payment capabilities. You’ll have complete control over the look and feel of your checkout and payment pages as well as the entire checkout process. Throughout the entire process, you’ll never touch consumers’ credit card data. Interactions with our servers are highly secured, preventing “man in the middle” attacks. Consumers’ card data is tokenized, providing further protection of credit card data during the transaction. There are a number of ways to generate unsuccessful transactions from a demo account. You can use the dollar amounts between 5000.00 - 5999.00 to trigger a variety of Bank Responses, where the desired response code is added to 5000. You can use the penny amounts to trigger a variety of eCommerce Responses, where the desired response code is added to 5000.00. For example, to simulate a transaction that encountered the "Unable to Send Trans" error (code 42) during processing, use 5000.42 as the transaction amount. Note: If both the dollar and penny amounts would trigger a simulated code (for example, 5200.42), the penny amount trigger will take precedence. Are recurring payment plans supported by Payeezy API? 1. Third party partners - Work with our partners (For example: Chargify) who can manage the recurring plan for you. Our partners offer APIs that you can use to create recurring plans and they can send us the recurring transactions on your behalf. 2. Recurring indicator - [US merchants only] Merchants managing their own recurring plans can pass the transactions through the API by utilizing the recurring indicator. In each of the recurring transactions, add this line - "eci_indicator"="2" to the request payload. This transaction will be processed as a recurring payment by the payment gateway. 3. Gateway portal - Merchants can create recurring plans manually via the gateway portal. What are the CVV2 response codes? U Issuer is not certified and/or has not provided visa encryption keys. I CVV2 code is invalid or empty. Z or X Server Provider did not respond. Blank No CVV code was sent and there was no indication that the CVV code was not present on the card. What are the AVS response codes? How do I test AVS and CVV2 responses in the sandbox environment? In order to simulate an AVS response in the demo/test environment, you can set the first character of the address value to the desired AVS response code. For example, setting the address value to "N123 Main St" for a transaction would simulate the AVS response code "N". If the transaction is processed under a terminal that has the "No match" AVS filter checked, the transaction will be declined due to failed AVS verification. How do I create the CSRs or public keys that are required for mobile wallet integrations? 1 – From wherever you are on the portal, select the ‘CERTS’ option in the top right. 2 – Here you can create your certificates for both sandbox and production environments. Creating a certificate is easy, just select the type of certificate you need, enter your app label and click "Add". 5 – Follow the instructions on Apple's portal to upload the certificate from step 3. After successful upload, you will be able to transact with Payeezy. Refer to our SDK guide to integrate your app. I used an incorrect card type in the transaction but it was still successful. Does the card type matter? When you are using a regular credit card, our system ignores the card type sent and determines the card type based on the first digit of the card number. However, if you are using a TransArmor token instead of a card number, the system requires the card type, as the normal credit card number logic does not apply. I have a certificate corresponding to my app. But when I create another one, the Payeezy system does not allow me. Why? We recommend, and it is a good practice, that you do not create multiple certificates for the same app. However if you still need to, please contact us and we will help you. As a developer having an app integrated to mobile wallets, do I need multiple certificates when boarding new merchants ? No. You do not need multiple certificates in order to support multiple merchants. As a developer you will need to download one certificate initially that you will register your mobile app with the wallet provider. When you add merchants to your developer account under the "Merchants" tab, a corresponding merchant token will be generated and linked to your app. You can use your certificate for any of the merchants in your "Merchants" tab. Note- All merchants need to have an acquiring relationship with First Data. How do I resolve "Invalid ta_token provided" error? This issue is applicable to US merchants only. This error occurs when the ta_token is inaccurate. Ta_token is one of the parameters that is passed in a token request. If you are using the default sandbox merchant "Acme Sock", then use ta_token="NOIW"
If you are processing live, then you will need to use the ta_token associated with your live merchant account. Note: TransArmor® needs to be enabled for the merchant account. If it is not or if you are unsure, please contact your merchant account representative or +1 855 799 0790 to have it enabled. Is there a way to delete a token or a way to update an existing token with the expiration, billing zip and CVV? A token is related only to the card number. The anatomy of a token doesn’t have any dependency on CVV, Exp date. If the card is expired the token still remains valid assuming that the new card that has been delivered to the consumer by the issuing bank has the same card number. If the card has been lost or stolen or has been cancelled by the issuing bank/consumer for any reason then the new card will have new number. In this scenario you have to re tokenize the card because the card number changed and it is entirely a new card. If you want, you can delete the token from your data base at your end. Once the card is tokenized with Payeezy there is no need to update the exp date as long as the new card delivered has the same card number. If the card number changes ….well it is a new card and has to be tokenized again. I am getting a "400 Bad Request" response. How do I resolve this? This error message is usually caused when invalid data is passed to the API. Cross check the data you are passing with the sample data shown in the sandbox API pages. I am getting the error code 401 in the response. How do I resolve this? Ensure that the API is enabled for sandbox environment. Do this by going to My APIs and edit your API. Ensure that you are using the merchant token listed in the "My Merchants" page under the "Sandbox" tab. Ensure that you are using the merchant token listed in the "My Merchants" page under the Live tab. I am getting a "403 - HMAC validation Failure" response. How do I resolve this? Ensure that the values of API key, API secret, token, timestamp, nonce and data used in calculating HMAC match the corresponding values used in the HTTP headers. Ensure that the correct hashing algorithm is used. Ensure that the API key, API secret and merchant token are correctly entered without leading or trailing spaces. Ensure that the timestamp in the HTTP headers is in milliseconds and represents epoch time calculated from UTC time. Ensure that the timestamp in the HTTP header is within 5 minutes of our server time. This depends on your server time. What is First Data's role in enabling payments with mobile devices? Provisioning and acceptance for mobile wallets are enhancements to the many innovative solutions that First Data has introduced, including Payeezy. In addition to ensuring both Financial Institution and Acquiring platform readiness and compliance with Network requirements, First Data is helping Issuers participate in the In-App experience by provisioning their payment accounts with new mobile account provisioning and processing services. What is Android Pay™? What does it mean to merchants and their customers? Android Pay™ is a cloud-based service which enables merchants to create a frictionless checkout experience for buyers using Android devices. Android users securely store their payment and shipping information in their Google Wallet. At the time of checkout, with a single tap, users grant merchants access to their billing address, shipping address and payment token information. The merchants then use the payment information received to complete the purchase. For customers, this means a hassle-free and secure checkout experience while for merchants it means less abandoned carts and happy customers. What do I as a merchant have to do to accept Android Pay™ payments? For in-app transactions, the merchant must integrate the Android Pay button using a Google Software Development Kit (SDK). Also, all US merchants must be subscribed to First Data’s TransArmor solution. * Availability of Android Pay depends on merchant’s country of domicile. Click here to check availability. Can I use Payeezy with my shopping cart, billing, or ecommerce platform? Yes. We have a strong community of shopping carts and eCommerce software platforms who integrate with us. Learn more about these partners and how they are leveraging our APIs by visiting their websites! In addition to the partners who are integrated via the REST API, we also have partners who have integrated via our SOAP based APIs. How do I become a Payeezy partner? Becoming a Payeezy Partner is easy! Whether you are a developer and decide to integrate and certify your solution, or you are an eCommerce software provider and/or a shopping cart, you can decide which level of partnership is right for you. Once you become a payeezy partner, we will share our revenue with you whenever a merchant referred by you processes a transaction. Email us at eCommercePartners@firstdata.com to learn more about the benefits of these programs. What currencies does Payeezy support? You can accept the following currencies from your customers. What kind of payment methods can be accepted? Our Payeezy APIs support payments via credit cards of all major card associations (VISA®, Mastercard®, American Express®, Discover®, JCB® and Diners Club®), Paypal™, e-Check and gift cards. Additionally mobile payments from Apple Pay® and Android Pay™ can also be processed. And of course we will continue to lead the charge with new and innovative capabilities when available. Check back regularly for updates. * Availability of certain payment methods depend on merchant’s domicile. Click here for details. What are the types of transactions available? Our Payeezy APIs support all of the basic payment instructions you would expect in running your ecommerce business including purchases, authorizations, pre-authorizations, refunds, reversals, voids, split shipments and more. See our Docs & Sandbox area for more specifics. * Availability of certain transactions depend on the payment methods available at the merchant’s domicile. Click here for details. Does Payeezy support split or partial shipments? Absolutely! Coding for Split Shipment is easy. The authorization request is identical to any other authorization request that is used in instances that payment is not being requested upon authorization. If the authorization has expired prior to the final shipment(s), then the merchant is instructed to send a re-authorization for the amount that has yet to ship. There is a response advice code as well in case anything changes with the card that was used as part of the original authorization. Make sense? Of course you can dig into the details and test out some scenarios in our Docs & Sandbox area. How to avoid chargebacks in eCommerce? With e-commerce transactions, when a customer pays with a credit card, reading the data on the credit card is not an option. The e-commerce never sees the customer, let alone the physical card. The e-commerce customer’s signature cannot be obtained or compared to the signature on the back of the credit card. Considering that a cardholder can initiate a chargeback on a transaction, even though the issuing bank approved it, these inherent limitations place an e-commerce merchant at a distinct disadvantage compared to their brick-and-mortar counterparts. Luckily, the credit card industry introduced extra tools that allow e-commerce merchants to verify a credit card. The first tool e-commerce merchants have available is the Address Verification System or AVS for short. It’s a system that verifies an address provided by the cardholder with the address the bank has on record. Something to keep in mind is that AVS only checks the street address and the postal code. It doesn’t check the street name. It doesn’t check the city. It doesn’t check the state. It doesn’t check the country. Y – The street address and the postal code match. N – The street address and the postal code do not match. Z – The street address doesn’t match, but the postal code does. A – The street address matches, but the postal code does not. Keep in mind that a bank will approve or decline a credit card independent of AVS. The issuing bank makes its decision without considering AVS. As an e-commerce merchant accepting a credit card for payment, the responsibility for considering the AVS results is solely yours. AVS is a tool for the merchant, not the bank. Another aspect to consider with AVS is that it’s only supported by banks in the United States, Canada, and Great Britain. That means if your customer is using a credit card issued by Indonesia or Germany, AVS will not be applied to the transaction. The other tool e-commerce merchants have available to them is the Card Security Code. It’s often referred to as CVV2 or CID. On Visa, Mastercard, and Discover, it’s a 3-digit number located on the back of the card. With American Express, it’s a 4-digit number on the front of the card. A unique aspect of the security code is that the only place it appears is printed on the card. It’s not on the magnetic strip or the EMV chip. It doesn’t appear in the transaction information. It’s never used for face-to-face transactions. It’s against credit card industry rules for a merchant to record or retain this number. It’s only to be supplied by the cardholder at the time of the transaction. M – The code submitted matches. N – The code submitted does not match. P – Card expiration not provided or card does not have a valid security code. S – Merchant indicated the security code is not present on the card. U – Card issuer is not certified for card security code verification. I – Card security code is invalid or empty. As with AVS, the issuing bank will approve or decline a card regardless of the outcome of the card security code check. The responsibility for accepting the card for payment is placed solely on the merchant. E-Commerce merchants should be highly suspicious of any credit card payment where the address and the card security code doesn’t match what the bank has in its records. Just because the bank approved it, doesn’t mean the transaction cannot be reversed in a chargeback. If a customer initiates a chargeback, and the transaction record shows that the address didn’t match or that the card security code didn’t match, the chargeback will almost always be decided for the cardholder. How can I create my sandbox account? Do I need to worry about PCI? If you are dealing with payments in any capacity, you absolutely should be concerned about PCI. We encourage all merchants to learn more about PCI DSS compliance, and to develop and implement a strategy to reduce and protect the cardholder data environment. And if you have further questions pertaining to PCI, please feel free to reach out to us. How you view PCI will guide which integration makes the most sense for your business. There are several primary factors to consider: how much flexibility you want within your payments page, how risk averse your business is with respect to cardholder data, and whether or not you have the right IT resources. Hosted Payment Page (HPP) or Hosted Checkout (HCO) - this integration method will offer you the quickest path to market for your payments page. In essence, we provide template payments pages that are hosted within our domain which will guarantee that you never have to touch cardholder data. Some configuration is available with respect to cascading style sheets, logo placement, etc. Direct API - this integration method allows you to retain full control over branding & look and feel of your payments page. The page is fully within your domain, and you can design the page however you like including where you place payment entry fields. Once all necessary information is gathered just execute the instructions against our APIs. Since the page is within your domain, any responsibilities associated with collecting cardholder data and/or PCI compliance will also fall within your domain. Learn more. Payeezy.js - this integration method offers the best of both worlds. Card entry fields execute a .js script that tokenizes the cardholder data within our domain such that you are never touching that information. And of course, you can still design the page however you like. Learn more. What kind of encryption/tokenization of cardholder data does Payeezy support? Payeezy is dedicated to leading the charge when it comes to tokenization & encryption of data as a further means of protecting sensitive cardholder data and preventing theft of credit card information in storage. Whether you are looking for information on supporting the latest standards from the card associations replacing traditional account numbers with digital payment 'tokens' for online or mobile transactions, leveraging 3DS and encrypted tokens for in-app payments, or exploring our existing Transarmor/Data Vault tokenization capabilities, we've got you covered. Specifics surrounding how this can be implemented can be found in our Docs & Sandbox area. What options do I have if I want to store cardholder data for multiple uses? Payeezy users have access to the Transarmor® and Data Vault solutions which use tokenization technology to remove the need for merchants to store card data by replacing it with a randomly assigned number, called a 'token', after authorization. Furthermore this token enables multi-pay, allowing the ability to perform an authorized financial transaction under strict control measures within the merchant environment. The merchant submits a token that it already has on file for a specific consumer/card, and we retrieve the PAN to complete the transaction. 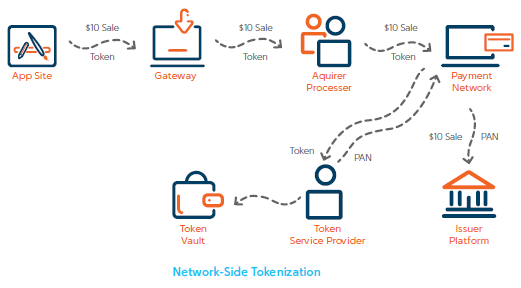 By using this type of token in the payment authorization process, the merchant reduces the risk of having the real PAN stolen as it is being collected from the consumer. Does Payeezy offer velocity controls? Yes, Payeezy offers velocity controls. Depending on which region you are coding for, different controls are available that allow a merchant to monitor transaction flow, transactions by IP address, by card number, and amount right down to the hour. How does use of mobile wallet based payments affect my use of TransArmor® or Data Vault? Acceptance of payments from a mobile device will not impact TransArmor or Data Vault processing; they are complimentary transaction protection methods for handling mobile acceptance. Most eCommerce developers are familiar with the concept of credit card vaults, which receive the PAN and replace it with a token to use instead. Many of the most popular providers use these vaults in their payment gateways including our TransArmor® and Data Vault solutions. This type lets users put credit cards on file and can be referred to as “gateway-side” tokenization. The defining characteristic of these tokens is that they’re scoped to a single merchant. They’re useful for a developer who wants to keep a credit card on file to enable low-friction transactions. But they don’t have the burden of securing and maintaining a database of PANs and the associated compliance issues. With the onset of payments with mobile devices, a new form of tokenization emerged; one that is closely associated with EMV, and that payment networks such as Visa®, MasterCard®, Amex®, etc. built. This new form is referred to as “network-level” tokenization. More on EMVCo specifications can be downloaded here. Through our engagement with mobile wallet providers, we are intricately involved with network-level tokenization. Payeezy.com and, as a result, any developer coding in-app solutions on the Payeezy.com platform uses network-level tokenization. Network-level tokens are very different. They are essentially aliases for PANs that are exchanged during an authorization by the network. In the case of the mobile wallet services, these tokens are provisioned (see below) into the device and used in authorization flows (further protected with 3-D Secure —see below). What is the difference between First Data's TransArmor® or Data Vault Solution and First Data's integrated token processing solution? The TransArmor® and Data Vault solutions are First Data's innovative technologies that employs a combination of end-to-end encryption and tokenization, solving for our merchant clients many of the vulnerabilities that exist in the payments-processing chain. When combined, encryption and tokenization provide an effective method for securing sensitive data throughout their lifecycle. First Data's integrated token services supports issuing clients with cardholder protection. It replaces the personal account number (PAN) with a token (a proxy number) within a digital passbook or card-on-file merchant. The solution uses the token rather than the PAN between the merchant and the Brand (American Express®, MasterCard®, and Visa®). The token remains valid as long as the PAN is valid. The token is stored and maintained at the corresponding Brand, serving as the TSP. How secure are transactions using mobile devices? Mobile payment software on supported devices will leverage Tokens to initiate transactions, eliminating the use of the card number within the transaction flow (from the merchant to the Acquirer and the Network). The Tokens are generated by the wallet provider and are stored either in the secure element or a host cloud. Both methods of token storage provide a high level of security. Authentication on the device is required (either biometric or pin based) for initiating the transaction and further secures against the possibility of fraudulent transactions being conducted on stolen devices. On the acquiring side, merchants may also be eligible for transaction protection with the TransArmor® or Data Vault solutions. This protects all transactions – not just those from mobile payment transactions – with data encryption and tokenization throughout the payment journey. I have an issue and need help, whom should I contact? My browser isn’t displaying correctly, which versions do you support? Payeezy strives to support all current versions and current version -1 of IE, Firefox and Chrome. If you have an issue with Payeezy on a specific browser, please contact us so we can take a look.